Fragments; misplaced modifiers; nominative vs. objective pronouns . . . you know what they are, but how do you explain them concisely? An ideal complement to any language arts program, these handy reproducible lessons define key terms, provide examples in meaningful contexts, and offer engaging practice exercises. The flexible format allows you to tailor the activities to the needs of all your students! 124 pages, softcover. 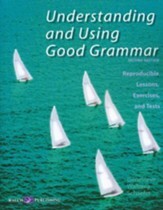 This newly revised and updated edition will help your students sharpen their language skills as they master the more advanced grammatical elements used in English sentences. More than 150 reproducible lessons, exercises, and tests lead students through infinitives, participles, dependent clauses, and more. A comprehensive system of review, analysis, and application ensures that students understand the material and can use the grammatical elements correctly. Each unit focuses on one new sentence element, explained with easy-to-follow definitions, explanations, instructions, and sample sentences. All activities include detailed teaching notes, grading scales, and complete answer keys. 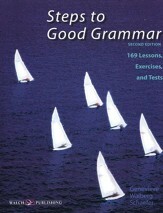 An ideal follow-up to "Steps to Good Grammar: 169 Lessons, Exercises, and Tests" (Christianbook stock #428765), these advanced lessons and exercises will help you prepare your students with improved language skills and a thorough understanding of English grammar! Softcover. 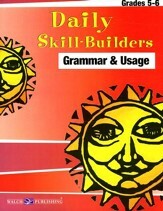 From the Daily Skill-Builders series, this supplemental grammar workbook contains 180 activities - one for each day of the school year. 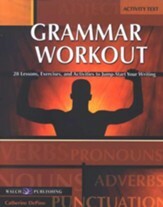 Exercises cover nouns, verbs, adjectives, articles, adverbs, pronouns, punctuation, subjects, predicates, and more, and take ten to fifteen minutes a day to complete. Word bank, fill-in-the-blank, writing, re-writing, and editing exercises included. Answer key included. Softcover, 195 reproducible pages. Grades 5-6. From the Daily Skill-Builders series, this supplemental grammar workbook contains 180 activities - one for each day of the school year. Exercises cover nouns, verbs, adjectives, articles, adverbs, pronouns, punctuation, subjects, predicates, and more, and take ten to fifteen minutes a day to complete. Reproducible pages. Answer key included. Softcover, 197 pages. Verbs-two-three! Nouns-two-three! Sentences-two-three! Here's an enjoyable exercise regimen that builds confident writing and speaking skills. The 28 lessons---featuring complete coverage of basic grammar, high-interest reading, short explanations, fun activities, and ongoing assessment---are presented at a manageable pace, and designed to appeal to all learning styles. Grades 6 to 8. 140 pages, softcover from Walch. Nouns, verbs, prepositions, adjectives---all the essentials of elementary through seventh grade grammar are here in these ready-to-use work sheets! Using a comprehensive system of review, analysis, and application, the 169 lessons, exercises, and tests will prepare your kids to use basic English at a competency level required of adults. A teacher's guide providing objectives, strategies, and answers accompanies each exercise. 325 reproducible pages, softcover from Walch.